I offer a variety of stunning handmade engagement rings, tailored to your exact requirements. All eternity rings are individually handmade to order. Get that one off special piece that will be personal to you and your partner forever. After the perfect fitting wedding ring. Do you need a design to match an existing ring, look no further. 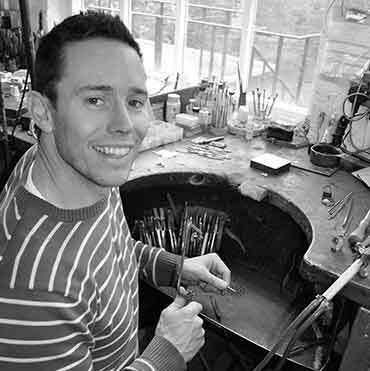 I have built up an excellent reputation making bespoke jewellery to meet the specifications of individual clients as well as making jewellery for many independent jewellers around the country. My philosophy is quite simple, the customer is at the heart of what I do. As a goldsmith each piece is handcrafted to the highest standard, produced in my workshop, using quality materials, traditional methods, specialist skills and unbeatable workmanship. I offer a unique, personal service so you can be confident the jewellery will meet your specific requirements and be made to the highest standard. Overheads are kept to a minimum, which means you get true value for money saving up to 50% on high street prices. My workshop is in the heart of the famous Jewellery Quarter in Birmingham. I see individual clients either there or in Banbury, Oxfordshire by appointment only. Free consultations and advise are offered. "We just picked up our finished rings this weekend and they are perfect, we will wear them with pride!"